The precision problems had been discovered as early as 2012, but only after several years of testing defence minister Ursula von der Leyen decreed in March that the G36, of which the Bundeswehr had procured approximately 170,000 units, „in its current construction status will have no future in the Bundeswehr“. Hoewever, before Tuesday’s decision the ministry also had considered the option to upgrade the weapons in its arsenal. Instead, the armed forces will procure „a new generation of assault rifles“, Suder told lawmakers. Requirements for the new standard assault rifle, to be defined until mid-November, „are going far beyond an upgrade of the G36“, which has been in service for almost 20 years. The forces procurement agency has already started a „market overview“, inviting tenders for assault rifles. 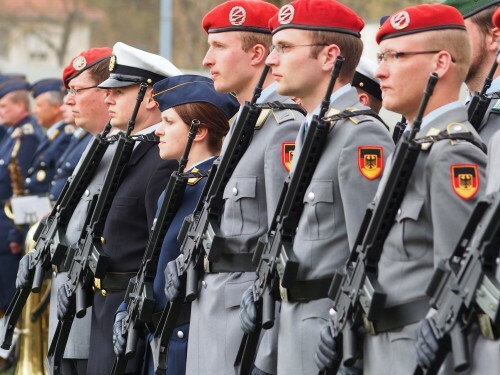 This could deal a blow to Heckler&Koch, which had been the main provider for the Bundeswehr’s small arms over decades, but had received heavy criticism from the ministry, lawmakers and public alike after shortfalls of the G36 had been officially confirmed. The procurement process might also re-open the debate on the calibre for a standard assault rifle in the NATO forces. With the G36 introduction in 1995, Germany had switched from the then 7,62mm standard round to the smaller 5,56mm calibre. However, after deployment in Afghanistan German soldiers had complained about the lack of penetrating power of the smaller rounds, re-enlisting the old G3 assault rifles with 7,62mm calibre the Bundeswehr had used before. Despite the problems with the G36 assault rifle discussed in Germany, armed forces in other nations using the G36 like Spain, some Baltic states and the UK had not mentioned any problems so far. Ich oute mich hier als interessierter Leser ohne Vorerfahrung, der der ganzen G36-Geschichte nur nebenbei gefolgt ist. Während das Ministerium eine sehr klare Linie vertritt, gibt es immer wieder ganz andere Argumentationen der Gegenseite (siehe zum Beispiel Schreiben des BMVg zur Genese der ganzen Sache – Link unten). Was ist da jetzt wahrscheinlich passiert? Gibt es hier Fachkundige, die mir das erläutern könnten? @GH: Siehe Bällebad zu Ihrer tiefgründugen Frage.